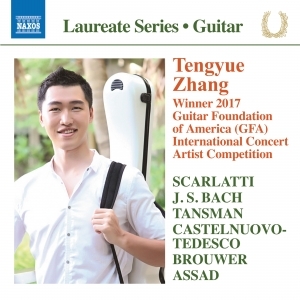 Tengyue Zhang (also know as TY) was born in Hebei, China and began to study classical guitar at the age of five with his father. At seven, he was introduced to Professor Chen Zhi with whom he studied at the Music School attached to the Central Conservatory of Music in Beijing. In 2012, he was accepted into The Juilliard School undergraduate program, and during his six years of study with Sharon Isbin, he received his Bachelor of Music in 2016, and his Master of Music in 2018. 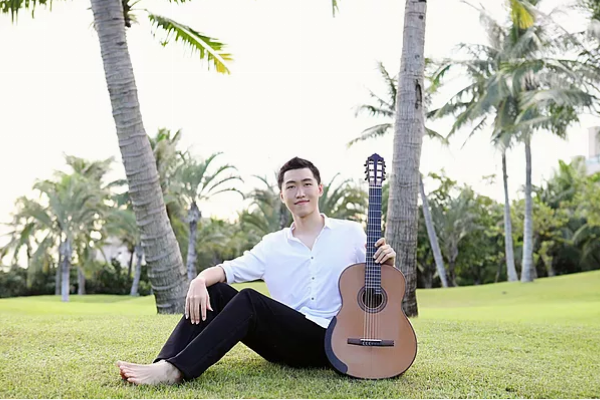 TY was the recipient of the First Prize in the 2017 Guitar Foundation of American (GFA) International Concert Artists Competition which led to his collaboration with Naxos for his debut album. We had the opportunity to chat with TY for a quick interview about his recent Naxos release, the GFA Competition, and his musical influences! What influence did your father have on your playing and love for music? My father is a passionate person about life and he is good at many things, which gives me great inspiration to choose what I want to do! When I was young, he was very talented at many instruments, such as guitar, violin, and erhu. He loves singing while playing the guitar. In addition, he was very good at swimming and Chinese Kung Fu! He would play guitar for me when I was little and I gradually grew fond of the instrument. I still remember the very first day I started learning the guitar, in our living room under the big clock. It was the first time I held the guitar with my father’s help. What did it mean to win the GFA International Concert Artist Competition, one of the most prestigious awards in classical guitar? It was a once in a lifetime experience to win this competition. While working with my great mentor, Professor Sharon Isbin, I have been able to meet some of my most challenging artistic goals, including performing well in this competition! It allowed me to share and spread my love of music with others from this album and the tour! You arranged a couple of the pieces on your debut album, most of which are not originally written for guitar. What is your favorite part of arranging these works for guitars and what challenges does that process present? Professor Isbin and I both collaborated on the arranging effort. I enjoy the creative process of finding ways to modify the score while fitting the style and formulas of the work in the best way. It was full of challenges and unconventional techniques, but I could not enjoy it better! How has your playing developed since studying at Julliard with the great Sharon Isbin? Since I studied with Ms. Isbin, I’ve learned so much about phrasing, rhythm, lyricism, shaping of lines, articulation, the art of colors, and the power of individuality. Each element is different in every piece of music. That is my goal for making perfect music. To produce the best possible music, one has to surpass the limitations of the instrument, which is—being creative! In choosing pieces for a recital or performance, what factors influence your decisions? I make the choice of repertoire based on what music speaks to me and touches me the most! To give a performance, I believe that in order to touch an audience’s heart, one has to touch one’s own heart first! Of the compositions on your record, which speaks to you most as an artist? Every piece in this album has something that expresses an important part of me. The Chaconne has its unique significance in human history. Scarlatti is very delightful, and I had so much fun arranging it. One can sink in and enjoy the colors and expressiveness in the Tedesco and Tansman. The two contemporary pieces are so distinctive that I cannot choose one over another! If I had to choose one that speaks to me the most, it is the Chaconne, because of its artistic depth and complexity. It is by far the most challenging work I have ever played and it has reached the closest to my heart more than any other pieces of music I have ever encountered. To learn more about TY, please visit here.